Molly Keane was an Anglo-Irish writer born and raised in Ireland, in a hunting, fishing family. Her mother was a minor poet. She was articulate and well-informed although having received little education from governesses and boarding school. She began writing anonymously, as it would have been held disgraceful for a young lady of her time to have her name appear in print. She wrote 10 novels between 1928 and 1952, and four plays, with John Perry, by 1961, highly regarded by critic James Agate. 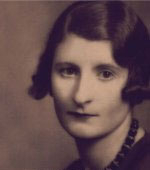 After her husband Robert Keane died at the age of 36, she stopped writing for many years, then made her comeback with Good Behaviour (1981), which became a literary sensation. Her extraordinary novels are beloved for their black comedy and the dialogue with which she brought to life the (now gone) privileged world in which she grew up -- often involving genteel poverty and loneliness. She died in 1996, leaving two daughters. Molly Keane is currently considered a "single author." If one or more works are by a distinct, homonymous authors, go ahead and split the author. Molly Keane is composed of 12 names. You can examine and separate out names.